This chart shows the trend expressed in millions of kilograms of exports of quinoa in Bolivia, Ecuador and Peru classified by color from January 2012 to July 2018. We can see a big difference between exports of white quinoa and the other colors. It is important to mention that the three countries have been exported a greater quantity of quinoa in that period, however it has not been classified in the Customs records. Get 2,800 real importers and exporters of quinoa in more than 100 countries worldwide. Currently, the prices of quinoa in Europe range from US$ 1.837 to US$ 6.002 per kilogram. 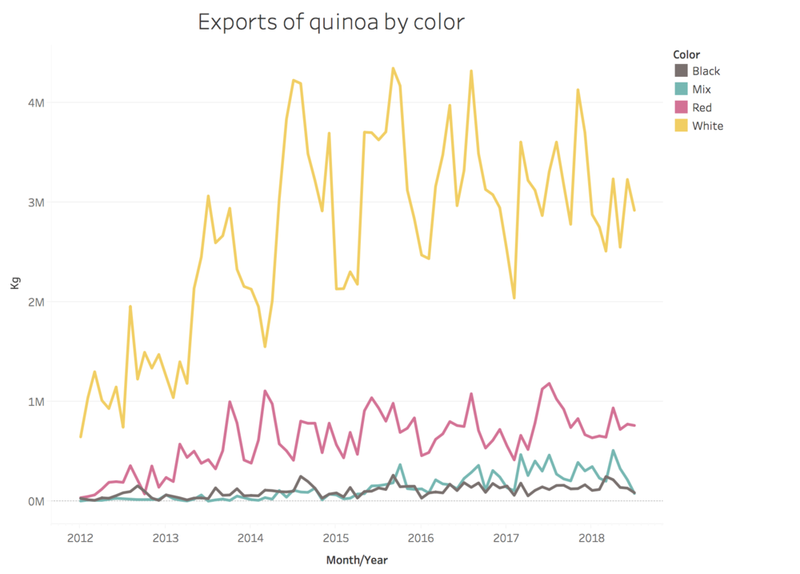 Exports of quinoa from Bolivia, Ecuador and Peru classified by color from 2012 to 2018. Comparative chart of quinoa prices between Alisur and Vinculos Agricolas.